I think that everytime I stitch this piece, Billy Idol’s “White Wedding” will play through my head. This about four hours into stitching my sister’s wedding sampler, White Wedding by Ellen Maurer-Stoh. I really like this piece. 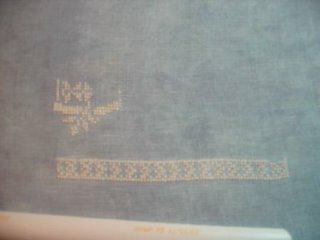 I am stitching it on a piece of 28 count Cashel linen in Dusty Blue from Silkweaver. This picture doesn’t do the color of the fabric any justice. In a bit of a coincidence, when I got my FOTM jobelan from silkweavers yesterday, it was a bit similar. Much more mottled, but at least I will still have a pretty piece of blue for myself to play with later. It will be perfect for the L&L Earth Angel that Carol so kindly sent me earlier this year. I will have to make a note on it to reserve it for that piece. Before I spent some time stitching on this piece today, I spent the afternoon hanging out with my mom. I got really lucky…I have a pretty cool family. Mom and I had lunch at Panera’s and then went to an outlet mall and Kohls. At the outlet mall, I got some shirts and dress pants for me along with some back to work presents for my friends at work who had this week off (without taking leave like I did…I envy their vacation, but love my paycheck). They will need it;) Then I want shopping for Allen at Kohls. He had gotten some things there yesterday and had gotten a nice gift certificate. Since he needed a few more things, I thought I would be nice and check out the Kohls near the outlets to see if had more than the one near our house. I got him a few more casual work shirts and two dress shirts with matching ties. After getting home, I took a 15 mintue cat nap with Zoe (miracle that she sat still that long) and got to stitching. Since Allen has been home, we have watched a few episodes of season one of Scrubs. Allen got seasons one and two for Christmas. When this show first came out, a few of the ladies I worked with (who’s husbands were all in med school) kept telling me to watch it, but I didn’t get into it until well into the season. It seems like it really was good right from the start. Alright…now that the new year is upon us, it is time to get back into diet mode. I had done really well for about a month in late November and early December. I had lost three pounds, but then got caught up in all the holiday food. Allen and I have great parents, but all three households seem to like to feed us..a lot. My goal is to get down to 150 by my sister’s wedding in May and to 130/125 by the end of the summer. Allen and I have made a deal in terms of rewards. When I get to 150, I get to buy the St. Petersburg kit by Thea Gouvernour and at 140 I get to by a really nice cross stitch floor stand. We are still thinking about a reward for me reaching my final goal…if the master bedroom is still not painted by that time I think I know what my reward will be…professional painters. Bribes are good:), but so is being healthy. Your sampler is going to be so pretty. I love the fabric choice! I love the fabric!! Good luck with the diet.